It was an incredibly boring October afternoon, when a certain Dutchman’s fingers double-clicked a TF2 icon for the first time. At exactly 17:29:36 GMT, this handsome Dutchman unknowingly set himself onto a path that will lead him through various pub experiences, gaming communities, personal projects and much more. We caught the Dutchman during what little free time he has, and asked him a few questions about absolutely everything. RD: As you are an old Team Fortress 2 veteran, it’s a safe bet that a lot of newer players don’t know about your first TF2 steps. When did you start playing competitive? Who or what got you interested in it? A: I stumbled on TF2 as part of the Orange Box that I bought for Portal to see what all the fuss was about with the cake. Found a nice Dutch public server called Gathering of Tweakers, who also had a bunch of competitive teams at the time. Played with them in Division 3 of ETF2L’s Season 3. That was so much fun that I also trialed for the Dutch national team, got selected to play there amongst such legends as Exfane and Demourge, who were already in FakkelBrigade at the time. Switched to that clan and rode the roster all the way up to Premiership when it was still called Division 1. RD: What made you stop playing? Did the taste of Premiership satisfy your competitive needs or did “real life” finally took over? A: Stopped playing in season 9 as the team got too good for me and I could no longer put in 4-5 nights of training per week after buying a house. 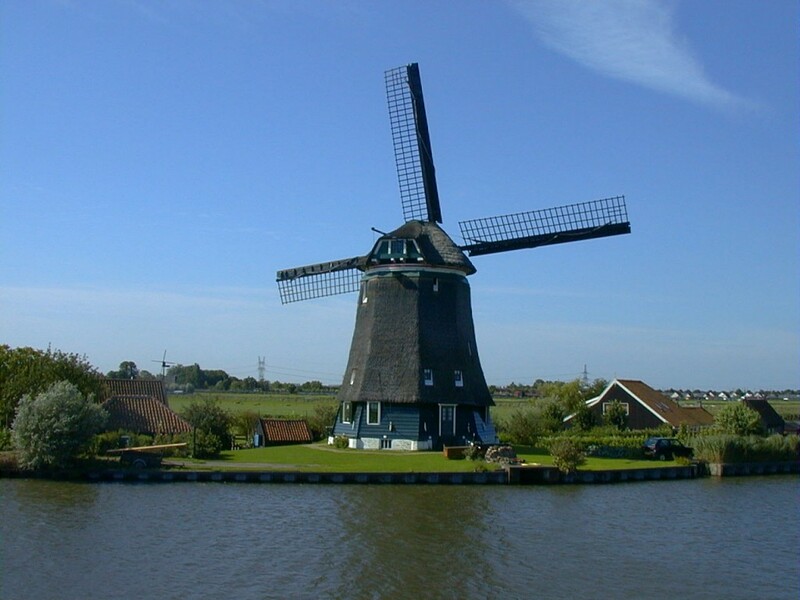 Clearly everyone in The Netherlands lives in a windmill! RD: Your loyalty to FakkelBrigade can only be compared to the Dutch loyalty to their King, but despite not playing actively, you are still very active in the TF2 community. Your biggest project is serveme.tf, a free of charge TF2 server renting website, and one of the biggest community projects in TF2 worldwide. Where is all this love to the community coming from? What made you stick with TF2 for so long, ten seasons after your last competitive match? A: FakkelBrigade originally rented a server to run a private Mumble and warservers. But we soon realised we could run a public Mumble, and had spare capacity for warservers and STV relays that we let people borrow. When FB ultimately folded I didn’t want to let all that die and I still used that server myself, so I continued renting it. People still occasionally asked to borrow warservers, but it was always a hassle: setting rcons, sending logs and demos after the match. So that’s why serveme.tf was made, a convenient way to lend out the 4 former FB warservers. The site quickly took off and thanks to a bunch of great community members (hi TC!) there are now over 60 rentable servers in the EU+NA. The TF2 community is just great and that’s why it’s fun to run these kinds of projects. People really appreciate it and help new projects grow and improve, that’s ultimately why I still try and make comp TF2 grow despite not having played a real match in years. More than 89 000 reservations so far prove the level of quality that project has. RD: In the latest Fully Charged: Europe WARUHYEAH had an interesting remark in which he pointed out how TF2 seems to be at the point now where community has all the tools that it could ask for (logs.tf,serveme.tf,new spectator plugin etc) to create high quality content and really get EU TF2 going – but the quality of games somehow gets weaker. What do you think of the current situation in Team Fortress 2? Is the game really slowly dying or are we talking about temporary bad map/unlock policy coming from admins, incoming summer and other possible reasons? A: Summer has always been the low point of EU TF2, I’m not too worried. In general, I think the quality of teams and players has gone up right until i49 or S16 finals maybe. The coordination, team-play and individual skill were in my opinion better than that of Dignitas in it’s glory days. The current premiership is not at that level, and might not be for a while, if ever, but the newer players and teams that stick together for the season will be much better in week 7 than week 1. RD: Talking about former glory, rumours are spreading that VanillaTF2/VanillaTV is slowly waking up. As you are one of the very few contributors to Vanilla lately, can you confirm/deny that rumour? Will you guys cover summer LAN? A: Well there’s VanillaTF2 the blog, which runs totally on community posts. It’s not doing too well, just the occasional awesome stats article by Gentleman Jon keeping it on life support. There’s also VanillaTV, the casting organisation, it also wasn’t doing too well after i49. i49 was such an amazing event for us, with Lange and Sal coming over and helping us making it such a great show. After that people just kinda burned out I guess. At the same time Jon1155 and others over at TF.TV really stepped up their coverage, especially for Season 17. Casting pretty much every game, most with Mumble comms, live stats and great production, so there wasn’t much will to bring it out of hibernation. But I guess some of us missed it enough to give it another go this ETF2L season. Regarding i52, I don’t think it should be the VanillaTV show again, that wouldn’t make much sense considering the effort put in by TF.TV after i49. I hope we can get a bunch of people of different orgs and continents to come over and make it a great production. Ozzie, Yankee and Euro teams + casters please! Also: VanillaTF2, there’s a “Write an article” link at the top, anyone with a steam account can submit one, go for it! 1. What is your favourite word? 2. What is your least favourite word? Programming, creating something cool from nothing, especially if people become enthusiastic users of what you made. Internet drama over vidya games, seeing people put each other down over dumb stuff, or getting stupidly involved myself. 5. What is your favourite curse word? Anything disease related, stereotypical Dutchman. The sound of pulling a cork from a whisky bottle. Partying neighbors at 2 AM on a weekday. Any profession focusing on personal problems. RD: That’s it Arie, a big thank you for being the second victim of our up-and-coming interview series. Any last second shoutouts? A: Shoutout to Lange, please come over again baby! Loved it… Keep it up, also with the amazing site. Nice interview Res. Look forward to the next installment.